A newly reorganized version of Nina's popular booklet - Abracadabra! The Kabbablah of Conscious Creation - with a new title and additional copy! 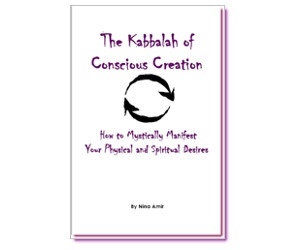 The Kabbalah of Conscious Creation, How to Mystically Manifest Your Physical and Spiritual Desires takes you through the four Kabbalistic worlds of creation to help you manifest your desires while also teaching you how to become not only a receiver but a giver as well, thereby developing a connection with the Ultimate Creator and tapping into the Divine flow of giving and receiving. Designed with short, easy-to-understand chapters, this booklet includes tips, tools and meditations for creating what you want and need on the physical and spiritual planes. This is the Law of Attraction through a Jewish mystical lens, but it is applicable to anyone from any religious background or spiritual tradition. We were created to receive all of God’s Divine gifts. Learn how to tap into that flow of goodness while discovering how to use the Law of Attraction to do more than simply fulfill your own desires. Develop a new desire: the desire for a higher consciousness that wants to give to the world as well. The Kabbalistic creation story of tzim tzum and the four worlds serves as a Jewish mystical conscious creation technology. By moving through the Kabbalistic "four worlds," you learn to combine inspiration/desire, thought, feeling, and inspired action, thereby putting the forces of creation into motion. You discover that by creating with the intention, first, of fulfilling your soul's purpose, and, second, of using what you create to give to others, you open yourself to the Divine flow, thus causing manifestation to flow forth abundantly. Taking a spiritual bent, this book will help you look at how to manifest a new desire, the desire for higher consciousness that wants to receive not just for the self alone but for the sake of giving to others. In the process of learning how to manifest your dreams and desires, you will learn about the nature of God, your own nature and how to achieve a spiritual connection with your Creator – how to be one with the One.This booklet acknowledges the fact that human’s were created with a huge desire to receive, because God created us as containers for all the goodness God intended to give us. However, sometimes – more often than we’d like – we feel that our containers are empty or not as full as we’d like. Using the Kabbalistic conscious creation technology, learn how to remove your blocks to receiving and how to be a good receiver. This helps you enlarge and to strengthen your containers, which, in turn, provides you with the ability give unconditionally. Since the release of the best-selling secular book and DVD The Secret, many people have become interested in the subject of using thought to "attract" what they desire. The Kabbalah of Conscious Creation discusses some of the same concepts but puts them through a Jewish mystical lens with a spiritual focus and an emphasis on inspired action. It also addresses some of the missing elements in and the elements that have been criticized about The Secret. "I just wanted you to know how much I have enjoyed reading The Kabalah of Conscious Creation and starting the corresponding exercises in the notebook. I have read many, many books on conscious creation, but yours was the only one that really touched me in a spiritual place and answered some of my unresolved issues. It also made me feel comfort in my religion. I think you are a wonderful maggid. I'm very much looking forward to my path of discovery." Don't forget to purchase the Kabbalah of Conscious Creation Workbook to help you begin manifesting your material and spiritual desires. Use this workbook to manifest your dreams and desires by moving through all the worlds, taking all the steps and using all the tools described in the booklet, Abracadabra! The Kabbalah of Conscious Creation and the revised, new version, The Kabbalah of Conscious Creation.